You may establish a hypertext link to the Site so long as the link does not state or imply any sponsorship of your site by STAR 101.7 KWGF-FM. However, you may not, without the prior written permission of STAR 101.7 KWGF-FM, frame any of the content of the Site, or incorporate into another website any material from the Site. Weather information on STAR 101.7 KWGF-FM is provided by the National Weather Service, is in the public domain and is not covered by copyright protection. STAR 101.7 KWGF-FM and its advertisers are not endorsed by or affiliated with the National Weather Service. The Site include links and pointers to Internet Site, content and services provided by third parties. 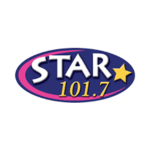 STAR 101.7 KWGF-FM’s linking to any third party Site does not imply an endorsement or sponsorship of such Site or the information, products or services offered on or through the Site. In addition, STAR 101.7 KWGF-FM does not operate or control in any respect any information, products or services that third parties may provide on or through the Site or on web Site linked to by STAR 101.7 KWGF-FM. The Site may contain facts, views, opinions, statements and recommendations of third party individuals and organizations. STAR 101.7 KWGF-FM does not represent or endorse the accuracy or reliability of any advice, opinion, statement or other information on the Site and use of or reliance on such advice, opinion, statement or other information is at your own risk. STAR 101.7 KWGF-FM may allow you to purchase many different types of products and services online that are provided by third parties. STAR 101.7 KWGF-FM is not responsible for the quality, accuracy, timeliness, reliability or any other aspect of these products and services. If you make a purchase from a merchant on the Site or Site linked to by STAR 101.7 KWGF-FM, the information obtained during your visit to that merchant's online store or site, and the information that you give as part of the transaction, such as your credit card number and contact information, is collected by the merchant. A merchant may have separate privacy and data collection practices. STAR 101.7 KWGF-FM has no responsibility or liability for these independent practices. For more information regarding a merchant, its online store, and its privacy policies, return to that merchant's home page and click on its information links or contact the merchant directly. You release STAR 101.7 KWGF-FM and its partners, affiliates, suppliers, licensors, officers, directors, shareholders, employees, representatives, contractors, agents and content providers from any damages that you incur, and agree not to assert any claims against them arising from or relating to your purchase or use of any products or services made available by third parties through STAR 101.7 KWGF-FM. You agree to be financially responsible for all purchases made by you or someone acting on your behalf through the Site. You agree to use the Site and to purchase services or products through the Site for legitimate, non-commercial purposes only. You also agree not to make any purchases for speculative, false or fraudulent purposes or for the purpose of anticipating demand for a particular product or service. You agree to only purchase goods or services for yourself or for another person for whom you are legally permitted to do so. When making a purchase for a third party that requires you to submit the third party's personal information to STAR 101.7 KWGF-FM or a merchant, you represent that you have obtained the express consent of such third party to provide such third party's personal information. Advertise or solicit to anyone to buy or sell products or services, or to make donations of any kind, without the express written approval of STAR 101.7 KWGF-FM. STAR 101.7 KWGF-FM may terminate or restrict your use of the Site or any part of the Site at any time for any reason without notice. In the event of termination, you are no longer authorized to access the part of the Site affected by such termination or restriction.